My poem, Number 7, inspired by the Anne Ryan collage of the same name, is up at The Ekphrastic Review, along with eleven other varied and interesting poetic responses. My thanks to Lorette Luzajic for selecting and posting my work, and for providing a wonderful forum for ekphrastic poetry and art. The mandala, above, was also inspired by Anne Ryan’s art. You can read more about her and see more of her work here. I’ve been neglecting the Secret Keeper’s prompts the past few weeks for lack of time, not interest. They are always like a puzzle for me, coming together in unexpected ways when I start to write. The appearance of the Fool, after a few drafts of ideas, was definitely a surprise. But serendipity is always part of the work I do. The end is never where I thought I was going. I took the photos of Japanese ceramics with the beautiful window light reflected on the glass display cases at the Metropolitan Museum last spring. I was reminded of them by Marcy Erb’s post a few weeks back of a photo with reflected light on a Buddha, and I think they fit with this poem. And I’ve resurrected a few Fools from past posts. The Fool (Zero in the Tarot) represents for me a capacity to be surprised and delighted, to leave an empty space to be filled by life. Wonder is everywhere; we just need make some room for it occasionally. Sorry I’ve been missing. We took a few days off and went to see my cousins in Florida. We hit the Ringling Museum of Art and the Big Top Circus Museum. The art was mostly the old masters stuff. They need to work on their contemporary collection. The grounds consisted of 66 gorgeous acres where John Ringling lived. The Circus Museum was separate and really interesting. 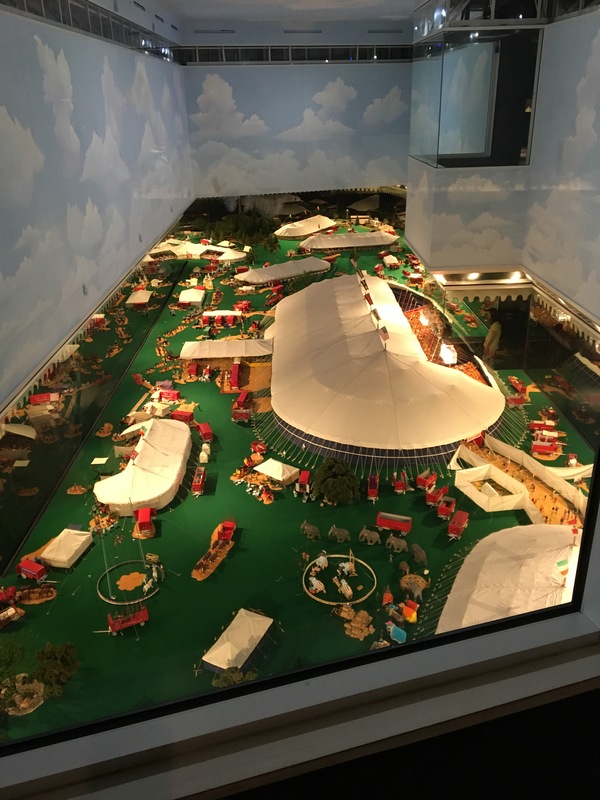 The main display was a huge 3800 square foot model of the 1919-1938 Ringling Brothers and Barnum and Bailey Circus by Howard C. Tibbals. This thing really blew my mind. I took a picture from above but you can’t really tell the scope of this. I didn’t do any drawing. Sorry, Kerfe. It was really hot down here which is no excuse. 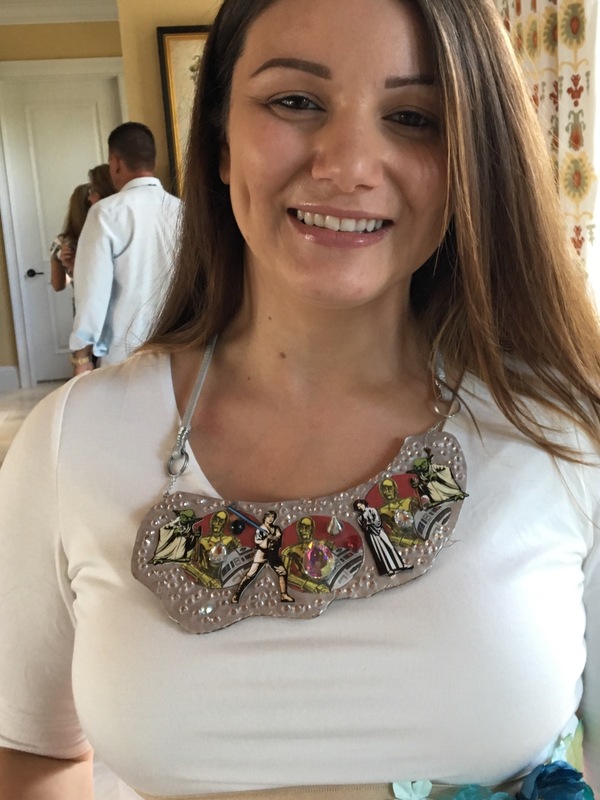 My cousin’s lovely and very pregnant wife wearing the Star Wars necklace I made her for the baby shower. All in all a very nice weekend! The Boston Museum of Art has an exhibit of the works of Matisse along with many of the objects he used in his drawings and paintings. He found this chair in an antique store and had to have it. What a find…the arms are eels! I went to Boston this weekend to visit my daughter and see the show. You can never get too much Matisse in my opinion (having this year also been to see him in Baltimore and Montclair). And there are always works I haven’t seen before, like one of his first collages, above. I like how he drew/painted the objects and then cut them out and arranged them. There were some beautiful textiles, like this North African cut screen. And of course he drew from his textile collection to drape the models for his portraits. I love the vibrant colors in the still life above. And I had never seen this paper cut out before. The museum is good for wandering. Suddenly you’re in a room with this burial urn from Mesoamerica. That’s a bat on top. John Wilson’s Martin Luther King Jr. prints were a highlight. Eldzier Cortor, another African American artist in the museum’s collection, shaped many of his print plates. This one is full of visions. There was a small show of the prints of Terry Winters, another favorite of mine. I always want to recreate his organic visions in stitch. The Magnetic Oracle made me think of Stevie Wonder today. As Nina said in her post, the “Matisse and American Art” exhibit did not allow photography…but if you are in the area, you should definitely take the time to go and see it. There are many wonderful works by both Matisse and artists who have paid homage to his work. One piece that attracted me immediately was by Janet Taylor Pickett, and to our delight there was an entire show in the museum based on a series she had done responding to Matisse. Her creative spirit is definitely kin to mine. Other works that delighted: a Nick Cave soundsuit. and several words by master collage artist Romare Bearden. This one shows Circe and Odysseus. Painter George Innes is from Montclair, and has his own room full of mysterious light. And the Museum also has a fine collection of Native American art. It was fun to visit with Nina and her family, and to celebrate her birthday in the company of Matisse and friends. It was a lovely spring day yesterday and Kerfe took the train in from the city to take me out for my birthday and see a show at the Montclair Museum. That photo is me and Kerfe looking at some paintings. They didn’t allow photos of the Matisse show. One of my favorites was an Andy Warhol. I tried doing a drawing and am including an image from the internet. The show was about artists influenced by Matisse. There was a wonderful Rothko, a Frankenthaler, Motherwell, all with a nod to the great Henri Matisse. Very inspiring! Kerfe gave me a beautiful gift. 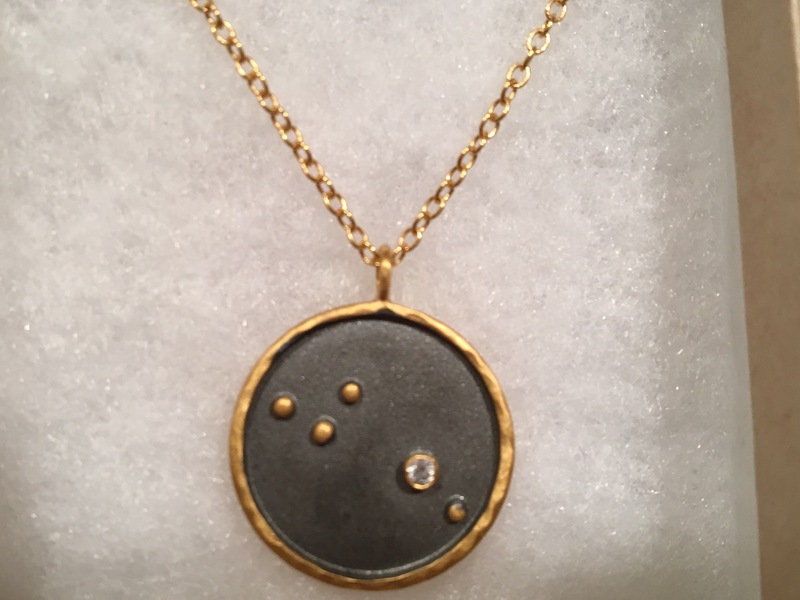 An Aries pendant with my birthstone, a diamond! My new signature piece of jewelry. Thank you Kerfe! first captured by sculpted earth. 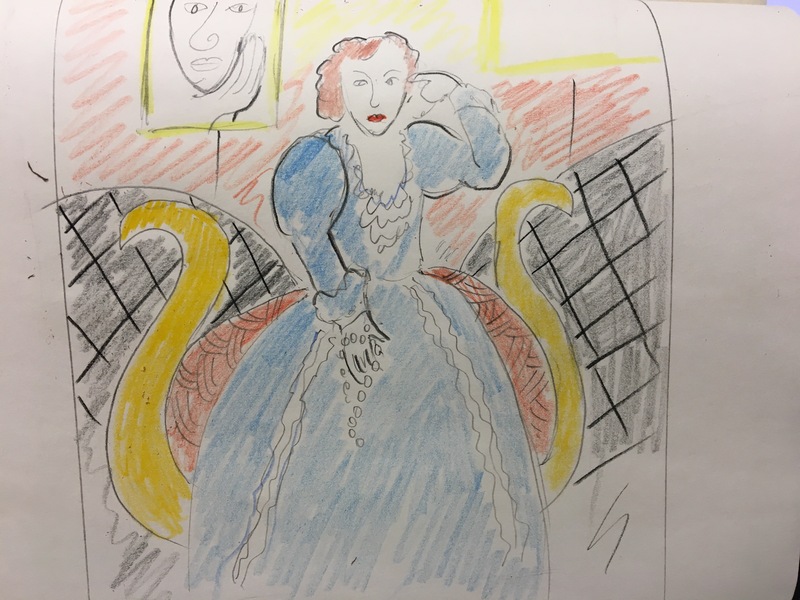 I went to the Met to see Max Beckmann (excellent) and ended up drawing masks, as usual. The one above is French, from the 1800’s, sculpted on a vessel of some sort. I drew this Mexican “twisted face mask” (dated 600-900) twice, because it looked very different from each side. It reminded me of Jack Davis’ artistic attempts to define his relationship to his autistic brother Mike. It must have been based on a member of the community, providing a link to the long-standing effort of humans to consider and include those who fall outside the spectrum of “normal”. This grinning monkey from the Ivory Coast also caught my eye. The poem uses the Secret Keeper’s prompt words this week. In 1916, W. B. Yeats wrote a dance play, “At the Hawk’s Well”, inspired by Japanese Noh theatre (to which he had been introduced by Ezra Pound) and Irish folklore. The Japan Society recently had an exhibit of UK artist Simon Starling’s commemoration of the 100th anniversary of Yeats’ work, along with some of the art that inspired both him and Yeats. and then I drew masks until my hand cramped up and my legs hurt from standing. When I looked at the drawings, it struck me how humans have always struggled to understand and live their lives well. We are united in both sorrow and dignity, all cultures, throughout history, all over the earth. Yesterday I took the train to Baltimore to see the Matisse/Diebenkorn exhibit at the Baltimore Museum of Art. Wow! but no photos allowed, so I’ll talk a bit about it at the end of the post. But…the Cone Collection! I had totally forgotten it was there too. The Gauguin cellist, above, stopped me in my tracks. The Cone sisters amassed an amazing collection of early 20th century art. Plenty of Matisse, like the figures and dancer above. I loved this tiny Renoir landscape. And I had never seen this Van Gogh landscape either. The brush strokes are almost like stitching. 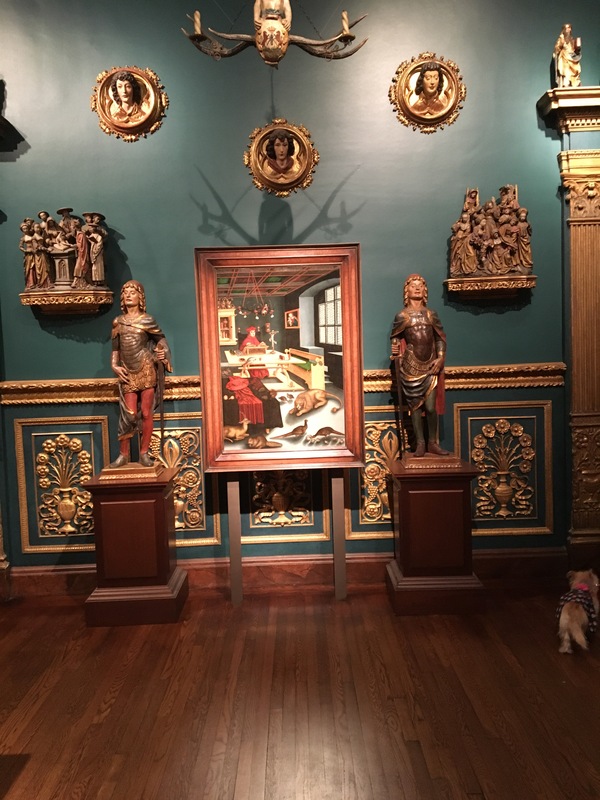 The museum also has many other rooms of modern art, and the painted wood relief sculptures above, by Gertrude Greene and Burgoyne Diller, reminded me of something Nina would do. I’m keeping in mind this portrait by Max Beckmann for my self-portrait series. There are also smaller collections of European and African and Asian art. I thought this mask from Angola complemented Raphael’s luminous and also enigmatic painting. But my very favorite item outside the Matisse/Diebenkorn exhibit was this cabinet decorated with reverse painted glass by Richard Lee. I was introduced to Richard Diebenkorn by Nina in 1976 when he had a retrospective at the Whitney (she was working there at the time). You can see a selection of the work on view now in Baltimore on the website, here, but as is true with any artist that works large scale, a reproduction can’t even begin to give the experience of the actual work. Matisse was an inspiration to Diebenkorn throughout his painting life, and the juxtapositions of the works makes that clear. Both artists: just wow. There are plenty of figural drawings, too, and one common element was the reworking of the page in a way that layered all the different lines of the different attempts. 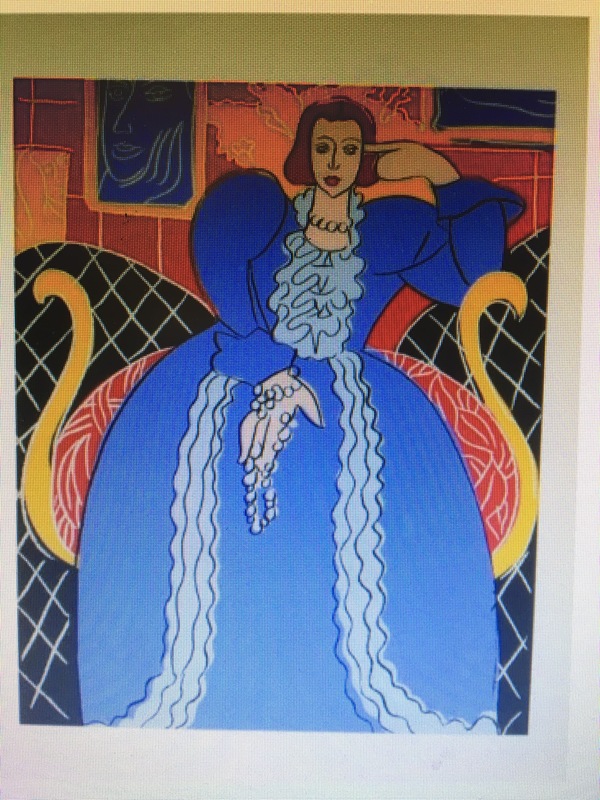 An example of Matisse’s work is below, a reminder that even great artists do not achieve satisfaction or perfection even after many lines have been drawn. They just keep working to get there.